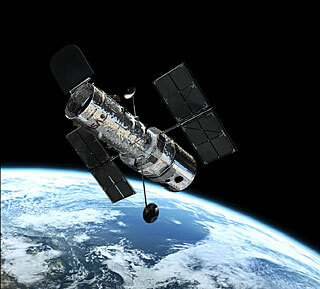 The Hubble Space Telescope is in many ways one of humanity’s supreme achievements. I remember as a child reading about the wonders that will open for us when we are able to put a telescope in orbit. The Hubble has certainly lived up to this billing. Among other accomplishments, it was part of the network of telescopes that helped scientists discover dark energy and the accelerating expansion of the universe, probably the most exciting cosmological discovery in my lifetime. I was recently building a paper model of the Hubble (Yes, I do that sort of thing. Hot, huh?) when I came across an interesting piece of equipment attached to the telescope. It’s called a “magnetic torquer” and it helps the Hubble to move about in an ingenious way. Consider the problem: you’ve got a telescope in orbit around the Earth. You can’t very well leave the telescope pointed in a single direction all the time. It needs to scan the entire sky. You also can’t move it around with any sort of propellant, as some of the fuel would inevitably end up on the telescope’s mirrors or other sensitive equipment. So how do you move? Electric motors can make the telescope move one direction, as long as a counterbalance moves the other direction at the same time. But eventually you’ll want to cancel some of that extra motion. It certainly would be nice to have something to push against, something with which to exchange some of that excess momentum. But there is something: the Earth itself! No, the Hubble can’t reach the surface of the Earth, or even the atmosphere. But it can reach something: the Earth’s magnetic field. It turns out that the magnetic torquers on the Hubble allow it to create a magnetic field that reacts with the weak but steady (at least on short time frames) magnetic field of the Earth. Engineers on Earth send a carefully controlled electric current into one or more of the three torquers to create the desired magnetic field. This field pushes on the Earth’s magnetic field, exchanging some momentum with the Earth, and moving the Hubble in just the desired manner. Amazing! I am constantly in awe not just of the universe around us, but of humankind’s ability to use ingenuity and creativity to discover the deepest secrets. Go Hubble!